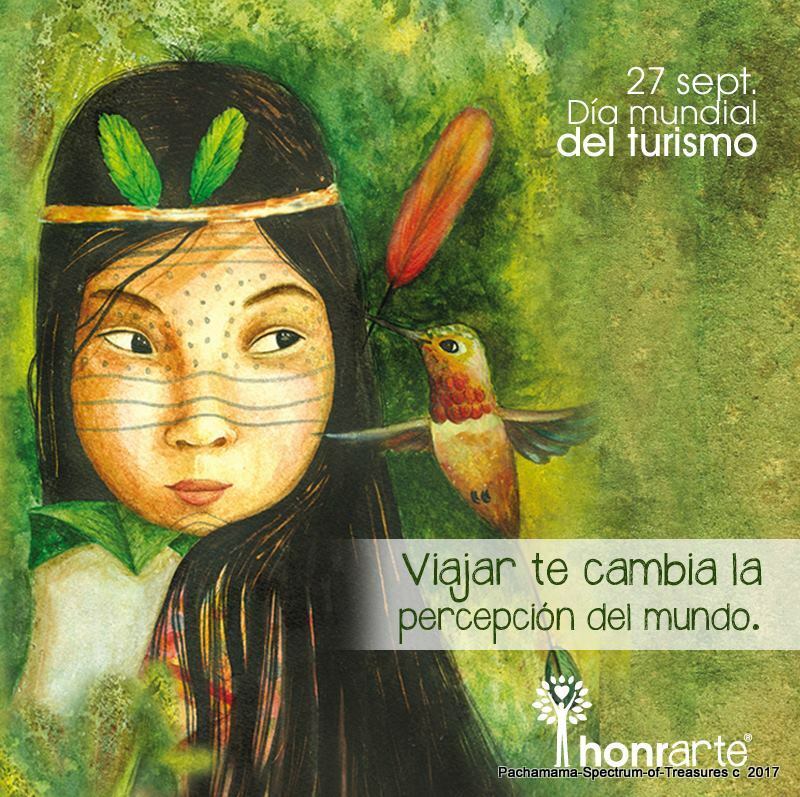 September 27th is World Tourism Day. When traveling ensure your tourism dollars support local communities in beneficial and sustainable ways. 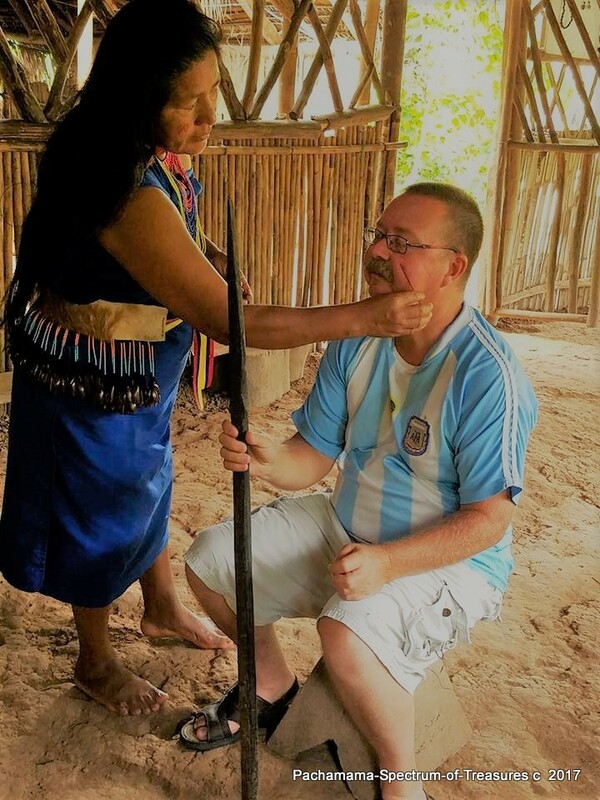 Choose community-based tourism for enriching, intercultural experiences often with ancestral stewards. Discover different beliefs and social norms. Community tourism values people, collective well-being, and harmony with nature over profit, and helps sustain many communities. Ecuador is a world leader in community based tourism with over 100 indigenous communities offering a wide variety of experiences. This sustainable form of tourism provides a unique and highly experiential aspect, providing you tangible involvement in life's daily activities, and a rewarding learning experience within a new culture. Prepare to be amazed as you see, hear, touch, and taste things you have probably never experienced. Gain a deeper connection with people and nature, developing awareness, empathy, and a new perspective. 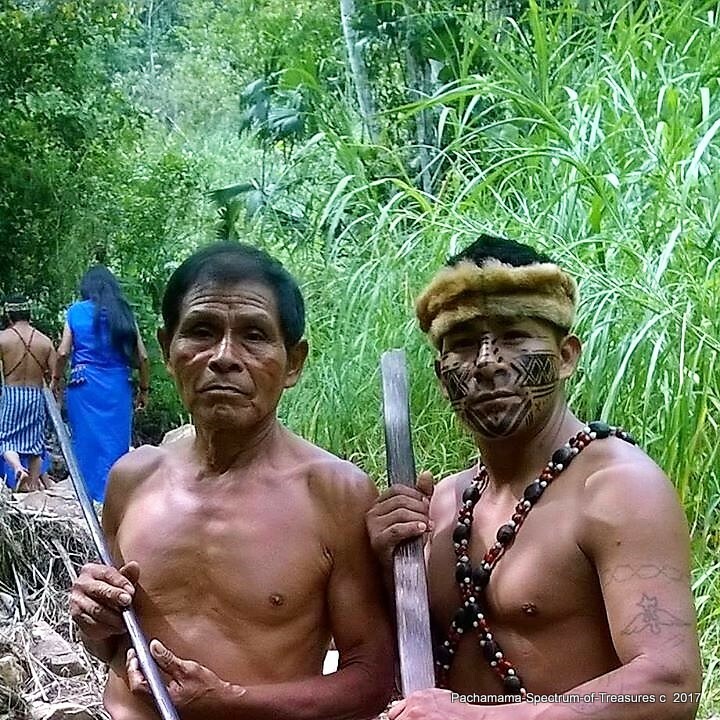 For hundreds of years indigenous peoples, Afro-Ecuadorians, peasants and montubios (mestizos) have been the stewards of the environment and ecosystems in rural Ecuador. Sustainable land management strategies have been handed down from generation to generation through a rich culture and tradition that emphasizes a strong conservation ethic. The community assumes collective responsibility for all aspects of your experience, including accommodations, internal travel, meals drawn from local agriculture, and cultural activities. It's economic benefits improves the local communities quality of life, health, and education, minimizing the migration to cities and preserving cultural identity. It also enables sustainable resource management. Today's adventure leads us deep into Shuar territory in the south eastern Amazon region of the province of Morona Santiago to Asunción parish and the tiny settlement of Santa Teresita. Located about 7 km from Sucua - " the paradise of the Amazon," easily reached by car, is Cascadas Kintia Panki. 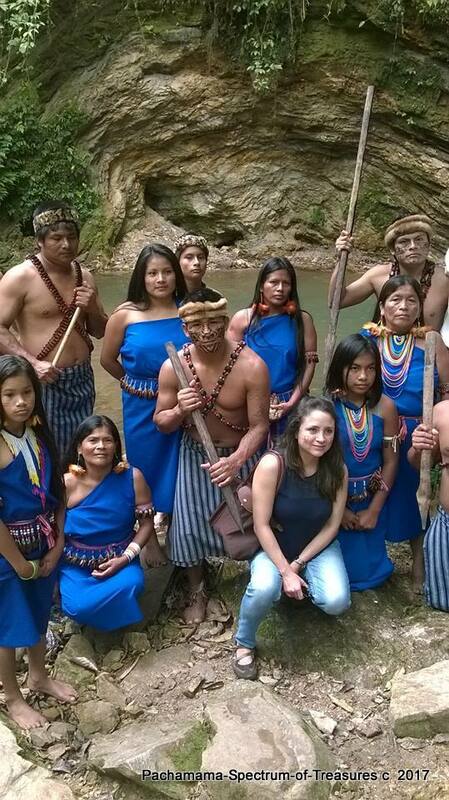 An area rich in biodiversity, which has being cared for by Shuar ancestral stewards for hundreds of years. A series of three impressive waterfalls journey into the valley below joining the Rio Tutanangoza which feeds into the larger gravel braided Rio Upano then ultimately the mighty Rio Amazonas. Stretching across the horizon, east and west, is pristine virgin jungle sparsely inhabited with small communities of Shuar. Kintia Panki means "Boa that eats the men." The ancestral legend speaks to this cooler, densely vegetated waterfall area being home to large dark Boa Constrictors who devoured anyone who approached. After a large earthquake the boa disappeared, and it is now completely safe. 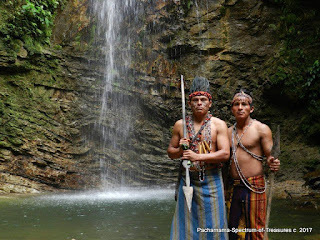 The area and waterfalls are currently under the care of the seven remaining Acacho, Shuir, Yancur Antúas, Shimpiukat and Pinchupá Shuar families. An important watershed for the area, water is the primary reason they care for this 300 hectare reserve - "In it is the strength of our God Arútam, protector of life and nature." They also protect it from logging and animal hunting. 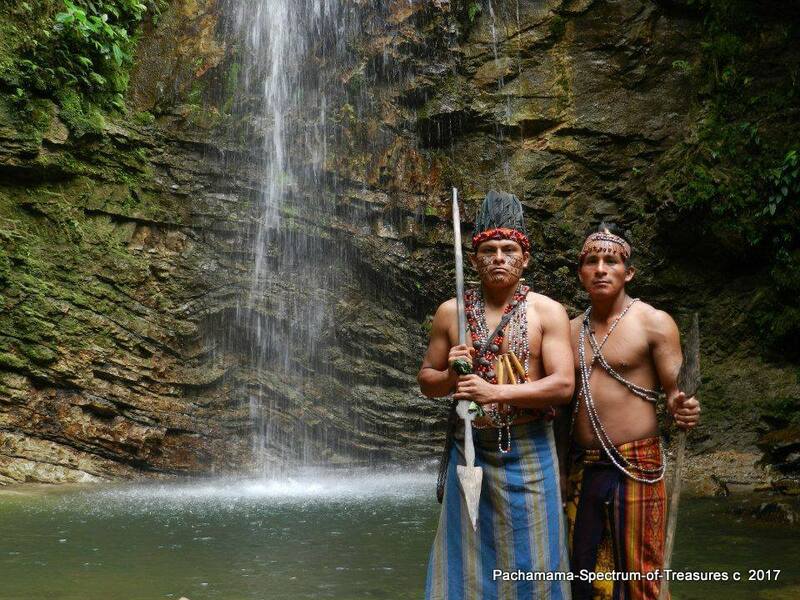 The cascade pools are visited daily by the local Shuar families for their cleansing energy. Doña Clementina Shuir and her nine children initiated the tourism project. 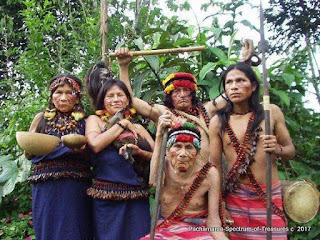 Away from conventional civilization, the Shuar have to be resourceful and self sufficient as they carry out their responsibilities. Living in this jungle of thick vegetation, abundant flora, fauna and water resources, amid the soothing sounds of nature, they live primarily off the land, hunt and fish, and they raise several head of cattle, and chickens for food. Our adventure begins in a traditional thatched roof, earthen floor Shuar family home. Dressed in traditional attire with face paintings we were received with a traditional welcoming ceremony and dance, both greeting us, and asking their God Arútam, for "permission" to enter the waterfalls in their native language. Achiote a plant with red dye was used to paint straight lines and circles on our faces representing respect for their God. 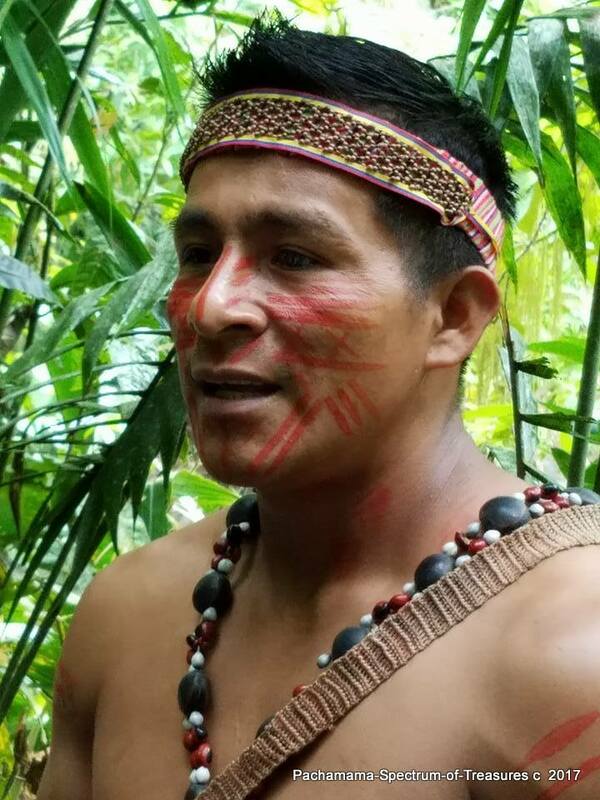 After the welcoming ceremony we were led by our wise and gentle guide Jaunito through the primary forests winding trails identifying a variety of medicinal plants, and criss crossing waterways. We discovered how the jungle is the pharmacy, grocery and hardware store that provides much of their daily needs. Many "new to us" species of trees such as Pitiuka, Zapán, Remo Egüiron, Matapa, Winchipos, amongst others. The lush vegetation is home to about 50 species of animals - monkeys, tigrillo, rabbits, guatusa, guanta, armadillo, and a lot of chirping birds. After about fifteen minutes we arrive at the first waterfall - Kisar ideal for taking pictures and admiring the lush landscape and vegetation. In the Shuar worldview, every animal and plant has a transcendental importance in nature, and they believe that the forest is filled with spirits that inhabit the waterfalls or riverbanks. Steep trail sections have stairs and handrails, only a short distance farther, we reached the second and most important Kintia Panki 35 m high waterfalls and crystalline pools. This is where the legend claims the Boa to have lived, but now it has become a sacred pool for shaman cleansing, and ceremonial baths of purification. 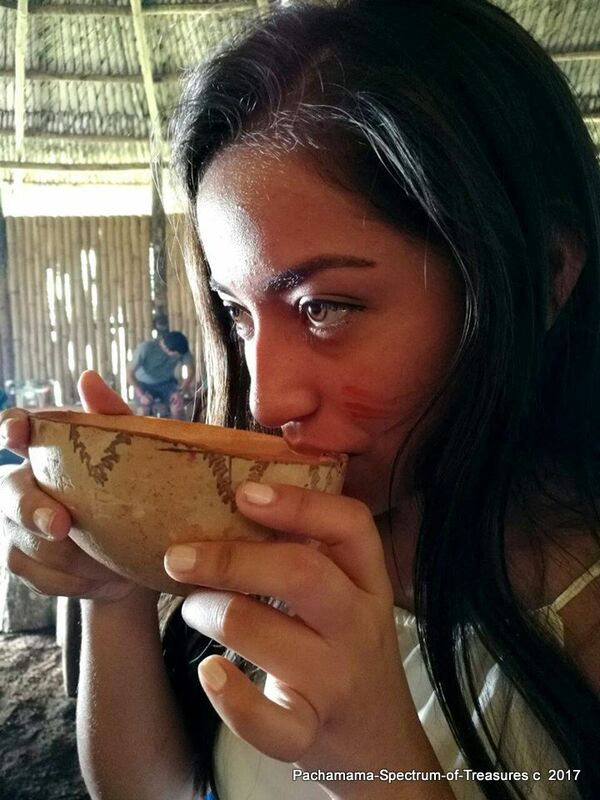 While Western medicine downplays wisdom and ancestral knowledge in Ecuador, our shaman Juanita provided a cleansing ritual. Passing around the body with native plants, and an aromatic mist asking their God to drive away diseases and bad luck, and cleanse and purify our souls from all negative energies. It was a magical experience with nature, in which he was very sensitive, and achieved an uncanny sense, and awareness of our personal lives. After that magical experience we returned to the community hall. We did not undertake the more strenuous multi-day trek to the third and highest waterfall Saunps where a daily early morning mist covers the vegetation, but rather returned for a delicious typical Shuar meal. 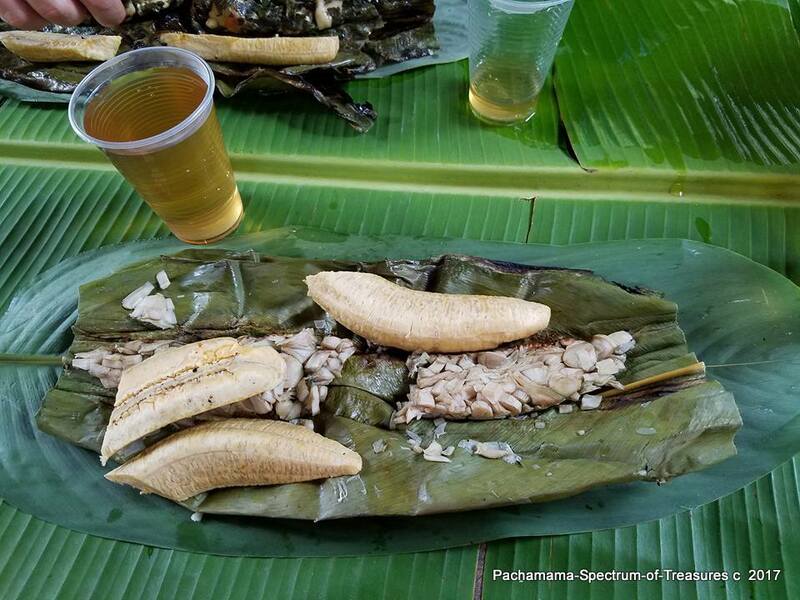 We had ayampacos which is chicken or fish roasted in a banana leaf over an open fire, with fried yucca and traditional beverages of Guayusa tea (caffeinated holly leaves), and chicha (fermented corn beer) from a wooden gourd. After lunch another ceremonial music and dance in which we participated (granted not very elegantly.) 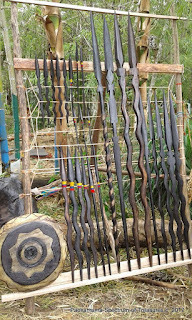 Finally a visit to their artesanal workshops - skillfully hand carved spears, rustic tools, handicrafts and jewelry made from environmental materials such as plant seeds, wood, stone, or bones, make for a unique, and lasting souvenir. 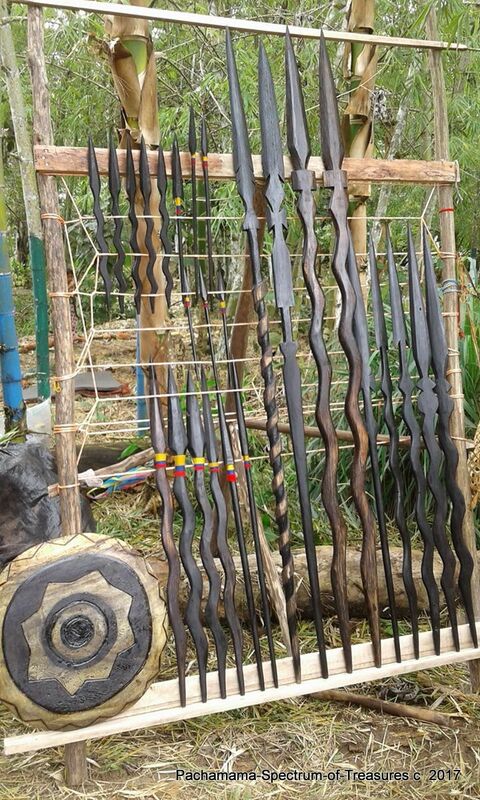 For the young and adventurous you can also experience an overnight camping trip to the upper waterfall, swimming, rafting, canoeing, and canyoning or learn about the use of blowguns, and spears in hunting. Our adventure caused us to grow in ways we could not have imagined. It was an exciting, renewing and ultimately fulfilling experience, where peace of mind, ecological mindfulness, and family life are natural and high priorities. The Shuar, currently number about 6,000, are the second largest, and most studied Amazonian group. They live on two million acres of ancestral territory, in remote areas with little outside influence. Shuar or Achuar Indians live in huts above the riverbanks in the southern Amazon rainforest in the province of Morona Santiago bordering Peru. They speak Achuar, a Jivaroan language. 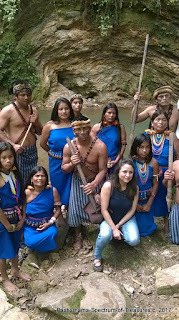 The Achuar are related to the Shuar. They share the same area, many of the same customs, traditions and also speak a similar language.They have a culture which is often misunderstood. 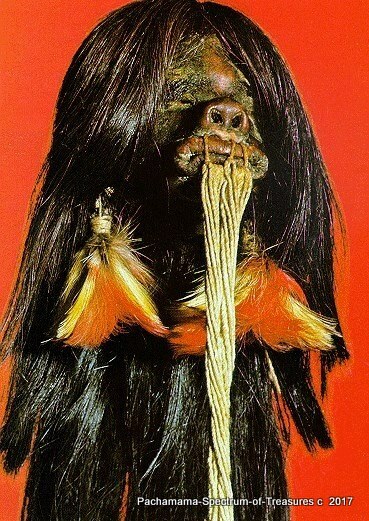 They are most famous as fierce warriors, headhunters, head-shrinkers, and for being practicing Shamans. 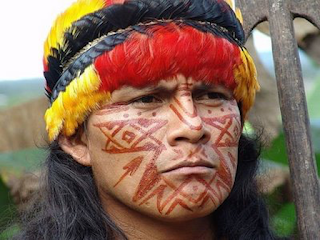 The rainforest, their home for thousands of years, is their sacred place of worship. They live without electricity, automobiles, or roads. 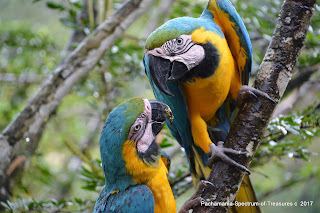 They are self sufficient with the forest providing them food, medicine, and materials for construction. Their ecosystem is harmoniously shared with pink dolphins, toucans, and parrots. Their geographic home is protected from outside interference by the eastern slopes of the rugged Andes and angry river rapids. When the Spanish invaded their territory the Shuar were successful in revolting, and most encroaching Spanish settlements were destroyed and their occupants driven away. Shuar homes known as "jivarías" were single room structures - divided for men's and women's spaces, 25 ft high oval structures, chonta-pole walls open on the sides, with palm leaf thatched roofs, dirt floors, and a bench around the circumference. Cooking is done on an open fire, and sleeping in a small enclosed area. Traditionally they were isolated in small clusters of 2 or 3 along riverbanks and only accessible by canoe. Once food resources were depleted in the area they would move to a new location. Life centers around the domestic household with hunting, fishing, and gardening pursuits. As horticulturalists they would clear the jungle vegetation and plant gardens of manioc. 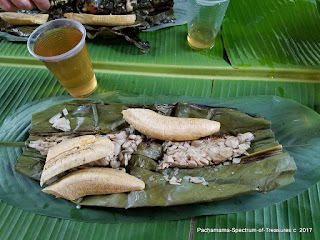 Manioc is both eaten and fermented into an alcoholic drink known as chicha. Women give birth to their children in the sanctity of their gardens. As they raised few animals, the men would hunt small animals with 8 ft long blowguns and " pencil lead " thin poison darts. Fishing may be done with a hook and line or with a wicker basket filled with crushed barbasco vines which weaken the fish. Daily each morning the entire family gathers to share stories for guidance, teach children skills, and to preserve their traditions and values. Some western technology such as motors for canoes, chainsaws, lamp torches, rifles and solar powered radios have been incorporated into their lives. An airstrip saves lives during medical emergencies. Even today these western influences are minimal. They want access to education and health care to evolve and retain their rights. 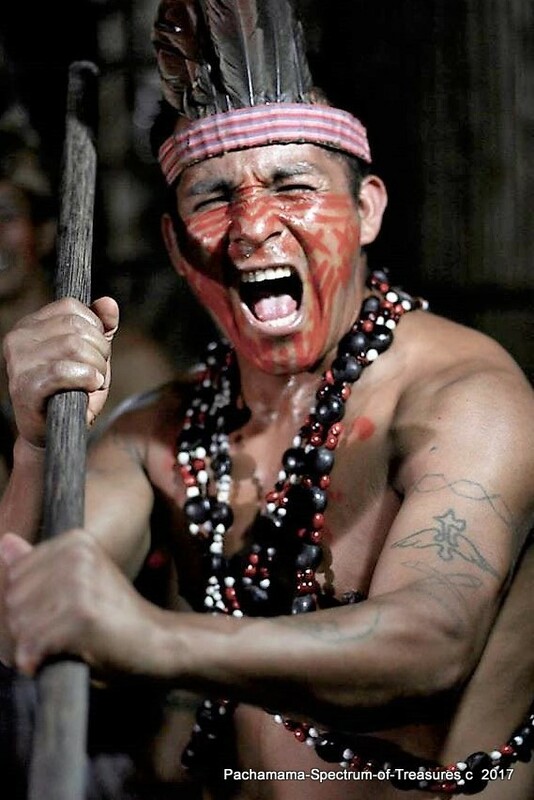 Shuar mythology is closely linked to nature and laws of the universe, and manifests itself in a wide range of superior beings related to phenomena such as the creation of the world, life, death, and diseases. The main ones are Etsa that personifies the good in fight against evil Iwia, which are always in continuous struggle to overcome one on the other; Shakaim of strength and skill for male work; Tsunki, being primordial of water, brings health; Nunkui causes the fertility of the farm and the woman. 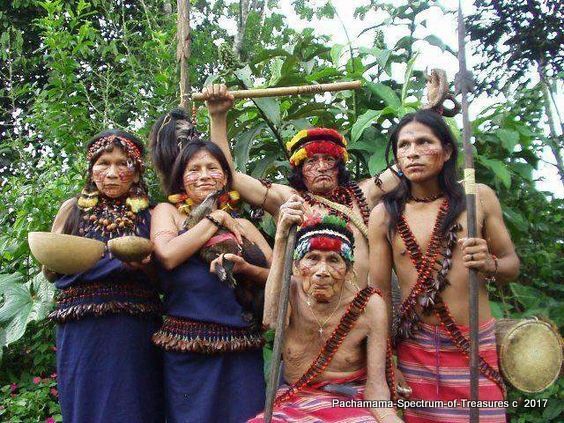 The Great spiritual world of the Shuar is repetitive. They don't believe the human being has an ending. They believe that after being born and fulfilling their lives, they do not reach a permanent state with death, but their spirit, Arútam, is received by another human being who can be his son or his grandson, who again fulfills another life cycle, so indefinitely. Arútam is regarded as a key spirit for males, because they believe it gives them more power and strength. They think that the one who possesses a Arútam, cannot die but of contagious diseases. The children begin to look for this spirit in the jungle from the age of six years. In the culture of the jungle, the Elements of nature guide the lives of their inhabitants. The shaman, called Uwishin, is a kind of priest mediator with the supernatural world and at the same time is a political leader. 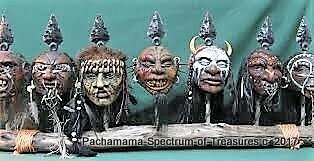 Shamanic practices are natural cures for human ailments, curses to cause enemies ailments or accidents, and to remedy problems caused by enemy shamanic practices. 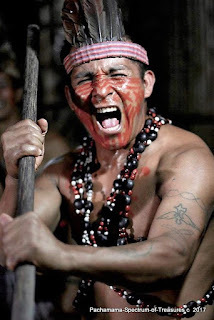 Hallucinogens of various kinds were used by Shuar shamans. Long ago, they beheaded their enemies, and shrunk their heads by seperating the skin from the skull and discarding the brain, eyes, and bones. Next they simmer the skin and hair in boiling water with vines for 15 minutes. Now half its original size it is dried and cleaned. Sew the eyes closed, and pegged or sewed the mouth and nostrils shut. Finally sear them with hot stones and sand to dry slowly over the fire's smoke. These creations were known as tsantsas. Cuenca's Pumapungo Museum & New York's American Museum of Natural History have displays of these strange yet fascinating shrunken human heads. Artifacts like these may appear to be bloody battle trophies, but as the Smithsonian Channel explains, they once served as protective talismans for the Shuar people of Ecuador. "They believed that the spirit of their enemy could still harm them after death, and that they had to take preventative measures. So by taking the head of their enemy and creating these very special tsantsas, they could actually, effectively seal the spirit of their defeated enemy in the head." 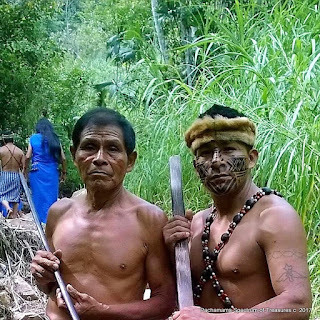 The United Nations has declared the Shuar Kapawi Lodge & Reserve one of the top five environmental conservation and community development projects in the world. They host about 1,000 visitors annually. Currently embroiled in a struggle to protect their resources in which native people have almost always lost. 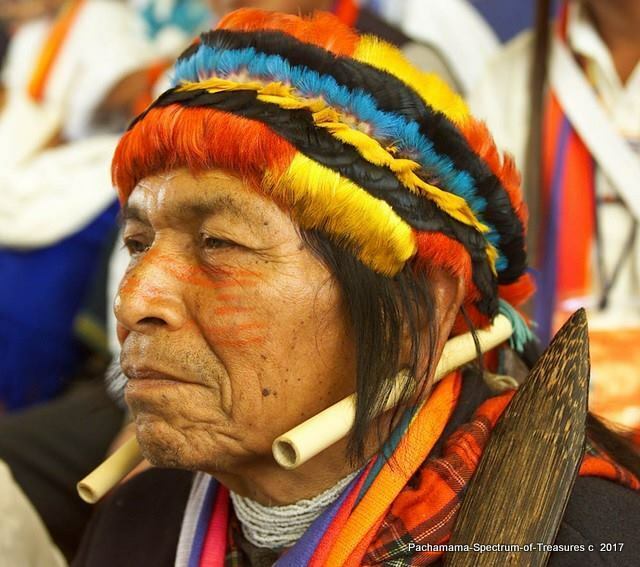 The government has ordered the breakup of a group named Fundacion Pachamama supposedly to stifle dissent and quiet those that speak for the Shuar. Within the Ecuador there are some institutional entities that are responsible for managing the development of this kind of tourism, and ensuring the best possible intercultural experience. 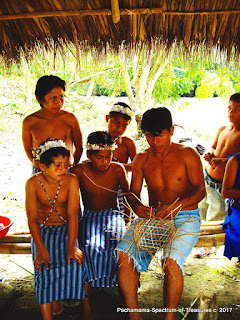 The only way to visit this indigenous village is with an approved guide for more information contact turismocomunitariokintiapanki@outlook.com Elias Akachu 0981663451 0993972474 or Jaunito Iwia Shuir , or Shiram Shuir at 0959774233.